Our citizen-scholars are prepared with explicit knowledge, skills, and dispositions to take leadership roles in civil society and democratic institutions upon graduation from college. Democracy Prep Public Schools was founded with the explicit mission of preparing our responsible citizen-scholars for success in the college of their choice and a life of active citizenship. Each Democracy Prep school has a civic education coordinator who creates and implements our civics curriculum for each campus and tracks our citizen-scholars’ long-term civic dispositions. Knowledge and skills alone aren’t enough. Our scholars need to feel an obligation to be true and authentic citizens of a community. 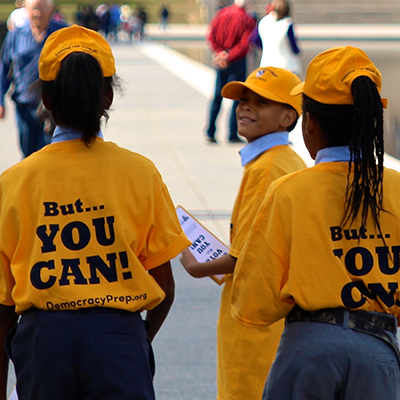 The American Enterprise Institute recently identified Democracy Prep as one of the nation’s leaders in civic education. The institute published a policy paper entitled “Charter Schools As Nation Builders: Democracy Prep And Civic Education,” which highlights our focus on both abstract citizenship and operational citizenship. Our citizen-scholars first learn important civic-knowledge to gain an understanding of our system of government. We then provide them with authentic opportunities to apply their civic skills in ways that are essential to becoming an engaged citizen. These skills include oral testimony in front of a public body, lobbying, campaign work, and others. We provide our scholars with opportunities each year to travel to their local city halls, state capitols, and Washington, D.C., to lobby our elected officials on issues ranging from charter school funding to the DREAM Act. Democracy Prep scholars have registered thousands of New York City residents to vote and conducted Get-Out-The-Vote campaigns for local and national elections. Our scholars have even testified before Congress.